Each QZFM provides an analog output via a 2.5 mm audio port on the back of the electronics module. 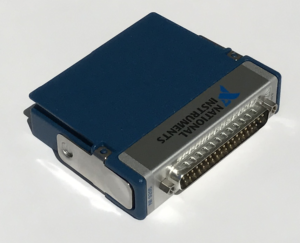 The analog output can be used to record the magnetometer signal with any data acquisition system. The voltage to magnetic field conversion factor of the analog output is 2.7 V/nT for both channels. The National Instruments NI-9205 (Figure 1) is a 32-Channel data acquisition unit that can be paired with the cDAQ-9171 (a compact bus‑powered USB chassis) and the QuSpin Connector Adapter (Figure 2) to provide 16-bit data recording for up to 16 QZFMs (2 channels per sensor). The NI DAQ channel assignments with the QuSpin Connector Adapter is shown in Figure 3. Figure 1: The NI-9205 with D-Sub connector. 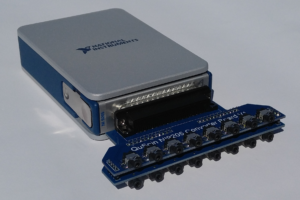 We have developed a User Interface (UI) for the NI DAQ based on LabView that can be used with the QZFM sensors. However, it is not necessary to have the LabView software installed to run the UI. Just download and install the free NI-DAQmax Runtime 16.1 prior to running the executable UI QuSpin NI-9205 Data Acquisition UI (.exe). You can also download the open (.vi) version of the LabView UI QuSpin NI-9205 Data Acquisition UI (.vi). The schematic and pcb files for our custom NI-DAQ adapter board can be found here: NI_9025_Adapter_Board_Schematic_V2.